Ascott’s 17th property in its Thai portfolio will be an ambitious mixed-use project. Due to open in the fourth quarter of 2016, Somerset Ekamai Bangkok, managed by CapitaLand’s Ascott Limited is but one of seven new management contracts in Southeast Asia. This puts them firmly in the lead as the largest serviced residence operator in Southeast Asia, which is their fastest growing market after China. They now operate over 15,000 apartment units in 80 properties over 9 countries, which is 40% of their total managed units. Ascott Limited believe that Southeast Asia is the perfect market where there is rapid urbanization, rising domestic consumption, a large young population and a rise in foreign investments pushing the need for quality accommodation. With their award winning expertise in managing international class serviced residences, a stay at the Somerset Ekamai Bangkok will not disappoint the discerning traveler who wants a home away from home with a little extra dash of indulgence. Ascott Limited ensures that your stay is not only one of contentment, but will provide enriching extras of the local culture, cuisine, diverse experiences and wellness facilities. The units are sumptuous and spacious with livable spaces and residential style amenities flowing through to their in-house personalized service. You can continue with your daily lifestyle routines juxtaposed with your new vibrant local surrounds in confidence. Comfort and familiarity are the two key concepts. 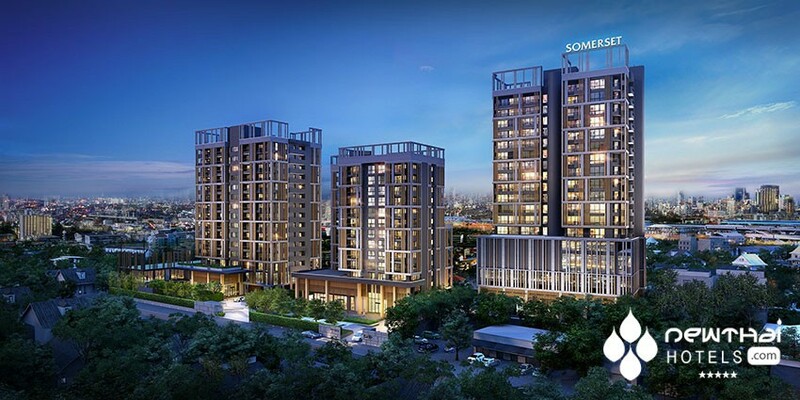 Somerset Ekamai Bangkok comprises of 130 units spread over 3 buildings from studio apartments to 2 bedroom residences. You will find an outdoor swimming pool to thrash out the daily laps, a gymnasium to pump a bit of iron in, a relaxing garden areas, elegant restaurants, a resident’s lounge and for the kids, a children’s playroom so they don’t have to make a mess in your unit. There is a state of the art multifunction conference center with 51 single bedroom units, dorm style for that perfect co-working environment. Aiming at the professional business conference market, for training seminars or private functions, there is an auditorium and 5 meeting rooms with audio-visual technology and wireless Internet access throughout. In the vicinity there is an international school and easy access to the Ekamai BTS station. This trendy Bangkok suburb is known for its upmarket condominiums, fantastic restaurants, hip bars and nightclubs. Friday and Saturday nights, Ekamai becomes the place to be seen. You can grab some fresh sashimi at the restaurant “Tororo” or a touch of Greek cuisine at “Olive”. If the taste of street food is more to your liking head to “Sanai Jai Gai Yang”. You can scoff down a few cocktails during happy hour at “Tuba” after checking out a craft beer specialist, “Mikkeller”. Shopping can be a bit on the generic side with Bog C, the Gateway Mall or Ekamai Power Center but if you are into a bit of retro, head to Unfashion on Soi 10. This entry was posted on Wednesday, March 23rd, 2016 at 12:18 am and is filed under Announcements. You can follow any responses to this entry through the RSS 2.0 feed. You can leave a response, or trackback from your own site.